The Pelican Path will be perfect if you like to do things at your own pace, get a bit of exercise and see over 50 of the most prominent and historic buildings in Key West, all for the grand cost of NOTHING. The path was the idea of the Old Island Restoration Foundation. They do a great deal of work trying to keep the architecture of Key West original, whilst ensuring the history of the area gets passed down from generation to generation. The paths map details a self-guided walking tour through historic Old Town. So how do you start doing the Pelican Path? Well first we would strongly recommend popping down to the Key West chamber of commerce at Greene Street and get yourself a copy of the official brochure. Or simply look over at the right-side of this page, and you will see the link to a printable version that you can have now if you want it. 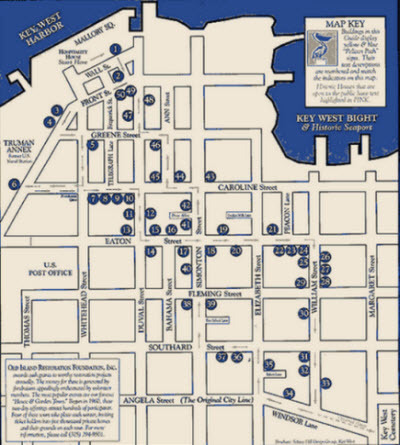 This is a handy and compact walking guide, which offers a short history of Key West as well as a suggested route. So Can You Visit The Houses You Pass On The Way? However there are many that you can go inside, and these are highlighted by the yellow pelican signs. Not only will you be fascinated by the Key West architecture, you’ll see within the properties, it will also give you a brief respite from the Key West heat. Don’t however, be surprised if you can’t spot these yellow and blue pelican signs, as many of them have been taken……(should have said disappeared) over the years. But that shouldn't worry you as the Path is a great adventure and relatively easy to follow. Where Should You Start Your Pelican Path Adventure? Well the beauty of it all is after you have picked up your map, you can start it anywhere you want. The official starting place (at least in sense of the lowest number ie 1) is over at Mallory Square, the home of the Sunset Celebration. Which is also the finishing point too, at the 50th thing to look at on Front Street. So what I would do is aim to start the walk around number 25 at William Street about 15:00pm in the afternoon, and then stroll around until you can join the goings on down at Mallory Square in the evening. Then whenever you want, finish the walk off from 1- 25 another day. What Will I See On During My Walk Around The Pelican Path? The majority of places that you will walk past, will of course either have had someone famous living in them, or be representational of a specific time or construction technique in Key Wests history. From homes once lived in by the President of America, like Trumans Little White House, to places of equal note such as the the graves and tombs at the Key West Cemetery there are some things that can take up quite a bit of time. Whilst others, if you were like me you barely looked at. I'm sure they would interest some people however. The Old Island Restoration Foundation estimate the whole tour to take one to two hours, but I think that is pushing it a bit, especially when you can take your time and really savour things. So now you know what to do, go out and do it, and if you are like me it would be rude not to stop off in some of the bars you will pass around Duval Street. There, I've given you even more reasons to take on the Pelican Path!